Kathy's Coupons uses fresh, low cost marketing strategies utilizing direct mail advertising for the retail shopping center industry.﻿ We work within your centers' budgets, reallocate dollars from your marketing and operations budgets showing little to no cost to you! Compare our rates with your current programs and enjoy the savings with many more benefits! We will provide a competitive quote in as little as 24 hours! Start saving today with Kathy's Coupons for your direct mail marketing campaigns and see why we have one of the strongest renewal rates in the industry! 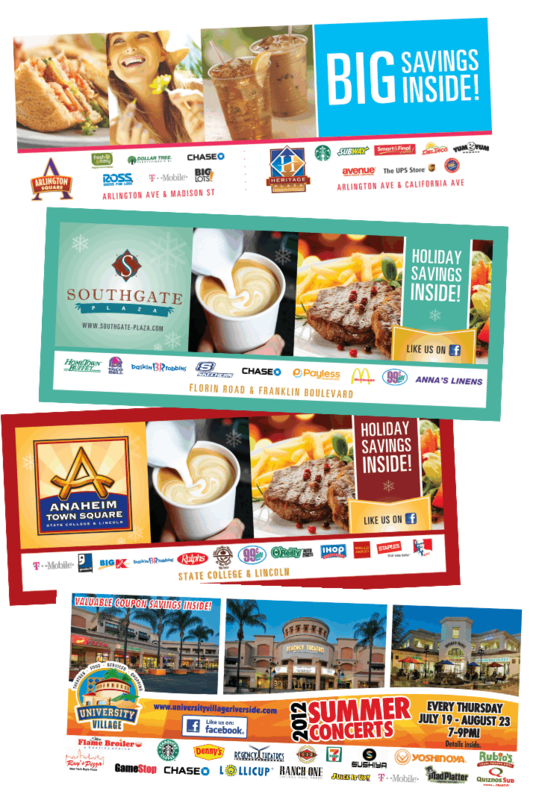 Direct Mail Marketing Programs For Retail Shopping Centers! Owners look to the management and marketing costs as significant parts of a center's overall budget. The critical decisions made by marketing will have a great impact on generating the center's revenue, while maintaining a stringent bottom line. Our customized direct mail marketing programs connect the centers with the customers and defines your core audience of new and prospective customers. For the past 24 years, Kathy’s Coupons has successfully raised the bar with our custom, independent direct mail marketing programs. These programs increase traffic to the centers and historically yield higher redemption rates & sales generated in all economic climates compared to the majority of other direct mail shopping center programs. Custom Creative - "No Cookie Cutter Designs"
Kathy’s Coupons is well known for producing one-of-a-kind and corporate branded designs with each promotion to meet shopping centers' specific needs. For a FREE consultation on your shopping center advertising, and to find out how much money we can save you, call today! Copyright 2014 Kathys Coupons. All rights reserved.